Ask RP Photonics on advice concerning techniques for single-frequency operation of various kinds of lasers. For a continuous-wave laser with a linear resonator, there is a standing-wave interference pattern in the gain medium. This gives rise to the effect of spatial hole burning, which leads to stronger gain saturation for the lasing resonator mode than for other modes. As a consequence of this, single-frequency operation is usually not achieved, unless the gain bandwidth is smaller than the bandwidth of the optical elements of the resonator. The twisted-mode technique  allows for single-frequency operation even for a large gain bandwidth. It involves the use of quarter-wave plates at both ends of the gain medium. Linearly polarized light coming from one end of the laser resonator becomes circularly polarized when going through a quarter-wave plate, the axis of which is oriented at 45° to the linear polarization axis. After going through the gain medium, is transformed to a linear state again. On the way back, the light becomes circularly polarized once again in the gain medium. The rotation directions are such that an interference pattern does not occur, and the optical intensity is not spatially modulated. 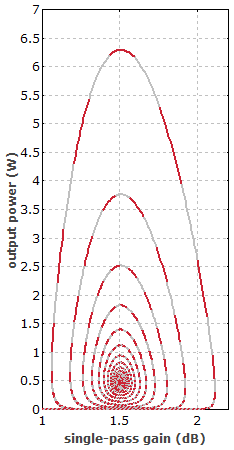 There is actually an interference pattern for each linear polarization component, but both patterns are out of phase, so that the total optical intensity is constant along the propagation direction. In effect, spatial hole burning is suppressed, and single-frequency operation can be achieved much more easily. The twisted-mode technique has originally been applied to solid-state bulk lasers, but it also works in fiber lasers [3, 4]. It can not be applied with anisotropic laser crystals, having a polarization-dependent gain.